Not since Sumardi Ma, he of the coffin notoriety, has a group of humans shown such er…creativity? Unspun had many years ago spent some weeks in the Northern Territory and found a land of great beauty and desolation. Since then it seems that nothing has changed. The Northern Territory remains beautiful and desolate, so desolate that few people have even heard of it, let alone visited it. So how do you market a place like that? 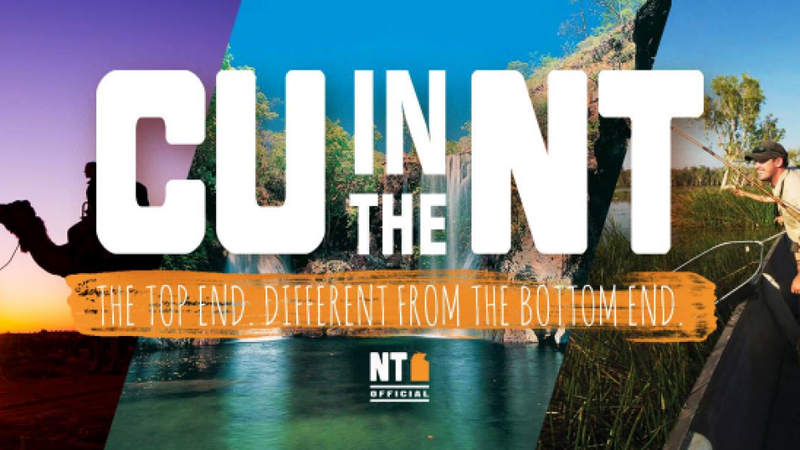 Well, the creatives working for Tourism Northern Territory have wrestled with the problem, injected some earthy Australian humor and come up with this totally original slogan/logo. Creative or just crass? You decide, but you can’t deny that it grabs you by the sensitive parts. The Malaysian bomoh(shaman, medicine man, con man whatever you call them) Ibrahim Mat Zin, who won notoriety for his antics involving a magic carpet, several coconuts and some nuts serving as acolytes in the search for the missing MH370 is now back. Never mind that his methods did not yield any results in the search for MH 370 (the plane is still missing and nobody in the temporal or spiritual realms seem to have a clue of its whereabouts), the good witchdoctor remains undaunted and altruistic. Like the caped crusader who cannot resist doing good whenever calamity strikes, the Bomoh has now trained his spiritual sights on the dry and hot spell affecting Malaysia. This time, the Bomoh, who seems to have a penchant for local fruits has enlisted the help of five watermelons and four funny looking acolytes. Will the Bomoh succeed this time when rather bureaus and modern science has failed? Only time will tell but Unspun, in his communion with the spirit realm, has divined that after the Vernal Equinox, where the sun gets closest to the earth and therefore makes it the warmest day we’ll experience, tomorrow, things will cool down. The spirits, however, are silent on whether it is The Bomoh’s handiwork that will result in the cooling of Malaysia, out of professional courtesy. Those of you who know Unspun would know that he looooves his pork. Not only that he would defend to the last bite the right of other porcine lovers to eat of their right to imbibe in The Other White Meat. The joys of pork consumption are many and profound but that should not make the eaters pigs themselves. Some sensitivity is called for, especially in a multi-religious society. So what is ostensibly can be interpreted as a case of religious intolerance on the part of Muhammadiyah in Semarang is actually a sensible objection to the insensitive nature of the Semarang Pork Festival. If the article below is accurate the objection to the Pork Festival was because it was being held in a very public place frequented by Muslims and as such might seen to ostentatious and provocative to some Muslims. Nothing wrong with that. SEMARANG – Festival masakan daging babi bertajuk “Pork Festival” di Semarang mengundang protes dari ormas Muhammadiyah setempat. Even tersebut dinilai berpotensi menimbulkan ketidaknyamanan bagi sebagian umat muslim. Menurut Ketua Pemuda Muhammadiyah Kota Semarang AM Jumai, acara yang rencanannya bakal digelar pada tanggal 4-8 Februari mendatang itu sebaiknya dibatalkan saja. “Ini untuk mencegah terjadinya hal-hal yang tidak diinginkan. Mengingat masyarakat saat ini mudah terprovokasi,” kata Jumai kepada Radar Semarang (grup JPNN), Selasa (2/2). Jumai mengatakan, acara itu dapat diartikan sebagai tantangan kepada anggota masyarakat yang mengharamkan daging babi untuk bereaksi. Apalagi, pusat perbelanjaan Sri Ratu yang jadi lokasi acara berada di kawasan dengan mayoritas penduduknya umat Islam. Jumai pun mengatakan, pihaknya tidak akan keberatan jika acara itu digelar untuk kalangan terbatas dan tidak dipublikasi luas. “Silahkan tetap digelar tapi khusus untuk internal saja,” ujar dia. Wakil Ketua Pemuda Muhammadiyah Kota Semarang Muhtarom menambahkan bahwa pihaknya tidak bermaksud buruk kepada penyelenggara acara. Menurutnya, Muhammadiyah hanya khawatir akan terjadi hal-hal yang dapat merusak kehidupan toleran yang ada di Semarang. “Jika tetap dilaksanakan dan dipublikasikan, kami akan melayangkan surat protes,” tegasnya. Common sense is not common and nowhere is it more uncommon than in the mind of the Transport Minister Ignatius Jonan. His latest feat of uncommon sense is in banning – and this is not very clear from statements his Ministry has made: online applications for commuter transport or anything less than three-wheeled modes of transport for commuting. This effectively puts a ban on Gojek and its imitators Grabike etc as well as Uber and its imitators. And there is some speculation that such a ban should apply to operators like Blue Bird too since they have a mobile app for ordering taxis. This is such a WTF decision that it leaves most people flabbergasted and at a loss to find out how someone could be so extraordinarily stupid to sign off on a law like that. Fortunately, President Jokowi is wise to this and in a Tweet this morning says he’ll be summoning Jonan to explain the ban. His excuse is that Ojeks are needed by the rakyat and no regulation should unduly inconvenience the rakyat. While there is nothing wrong with championing the Ojek and the convenience of the Wong Cilik, there is another reason why Jokowi should give the over-promoted stationmaster of trains a drubbing: the banning of Gojek. Gojek has evolved to be more than just a business in Indonesia. IT has become a symbol that many Indonesians hold dear on many levels. On one level is the fact that it is a home-grown success story; on another it represents the best of Indonesian creativity (of using technology to solve a huge problem that Indonesians face – traffic jams – by organising a readily available resource – the thousands of ojeks and their riders); on still another level it is a great startup success story in a field where there are very few successes. All these reasons are good ones for the President to put Jonan out of his misery of holding a post that he is not ready for. Let’s not forget that this is the same minister who shot his mouth off on aviation investigations before the NTSC had a chance to do their work and on the banning of Airlines to sell air tickets at airports after a LionAir mishap. So here’s a win-win solution for the President: Demote Jonan from Minister to his old post at the head of Indonesia’s Railway network. That way the nation would lose a bad minister and gain a good railway manager. Things will once again get back on track. Ah! how the world has changed. There was once upon a time where the needs of labourers were essential items that occupied the lower rung of Maslow’s Hierarchy of Needs like shelter, food, decent wages. But that was in the Dark Ages. These days the labourers have morphed into worker and their basic needs have changed. And that is the reason why this May Day Indonesian labourers are demanding that the Government agree to the 84 items that they have listed as being part of their Basic Needs. Among the items are Television (because radio ain’t loner good enough to keep the workers informed) , telephone credits and – nothing to sniff about – perfume (because workers have to look good to communicate effectively with the Capitalist bosses). So workers of Indonesia unite! You have nothing to loose but your privacy time, your isolation and your BO. detikNews : Minta Uang Parfum, Buruh Wanita: Kami Perlu Percantik Diri.Jakarta – Buruh menuntut pemerintah menyetujui 84 komponen Kebutuhan Hidup Layak (KHL) yang di dalamnya terdapat kebutuhan untuk Televisi, pulsa, dan parfum. Beragam buruh mendukung ajuan tersebut. Ini dia alasannya. Seperti yang diutarakan Nyonya Ne (43), karyawan perusahaan tekstil PT Unitex Bogor ini mengaku tiga komponen tersebut merupakan kebutuhan penunjang produktivitas para buruh. Televisi, menurut Ne, dinilai mampu meningkatkan kapasitas wawasan dunia luar para buruh. “Dulu itu radio 4 band, itu kan sudah enggak signifikan. Kita butuh hubungan informasi cepat. Kalau radio 4 band itu seperti pembodohan, tidak memberi kesempatan pada buruh untuk maju,” kata Ne saat berbincang dengan detikcom di Bundaran HI, Jumat (1/5/2014). Perempuan yang sudah bekerja selama 20 tahun ini juga menilai perusahaan seyogyanya memberikan pemenuhan biaya untuk parfum. Item ini menjadi perlu dengan alasan menjaga penampilan di lokasi kerja, terutama kenyamanan saat berhadapan dengan pimpinan. “Pekerja juga perlu mempercantik diri, ketika beraktifitas banyak keringat keluar, komunikasi dengan pimpinan enggak mungkin juga buat tidak nyaman,” ujar perempuan yang tergabung dalam Serikat Pekerja Nasional (SPN) ini. Senada dengan Ne, Rudi (23), buruh pabrik Adidas Tangerang, mengaku tiga item tersebut diperlukan buruh. Alasan yang dilontarkan tidak jauh beda dengan yang dilontarkan Ne. Pria yang baru pertama kali ikut aksi ini ditemani sang istri, Rina (21). Dia bercerita mengenai upah yang didapat dengan biaya yang dikeluarkan selama sebulan. Menurutnya, dari gaji Rp 2,4 juta dia baru bisa menyisihkan Rp 500 ribu setelah dipotong kebutuhan setiap hari dan bulanan.